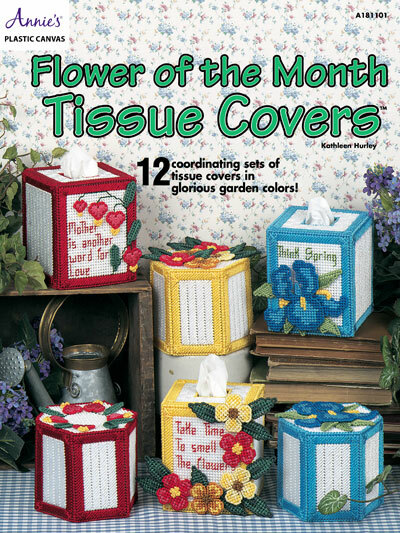 12 coordinating sets of tissue box covers in glorious garden colors! Designs for 12 sets of boutique-style tissue box covers and matching covers for tissue rolls are all worked on 7-count plastic canvas using Plastic Canvas Yarn and #3 Pearl Cotton. Each set has a different flower of the month. 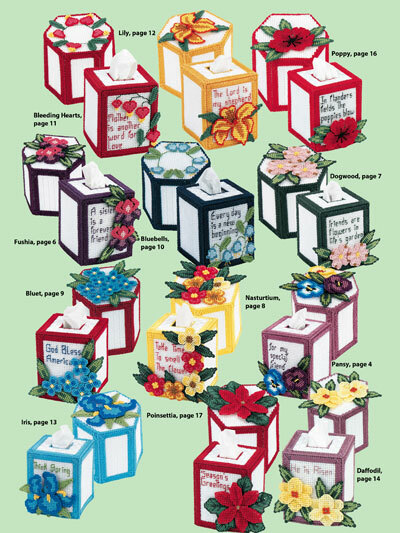 Sizes: Tissue Box Cover 4 3/4" x 5 3/4" x 4 3/4"; Tissue Roll Cover 5 1/2" x 4 3/4" x 5 1/2".